Geothink students, staff and faculty at the 2017 Summer Institute at McGill University in Montreal, QC. We’re very excited to present you with our 14th episode of Geothoughts. You can also subscribe to this Podcast by finding it on iTunes. 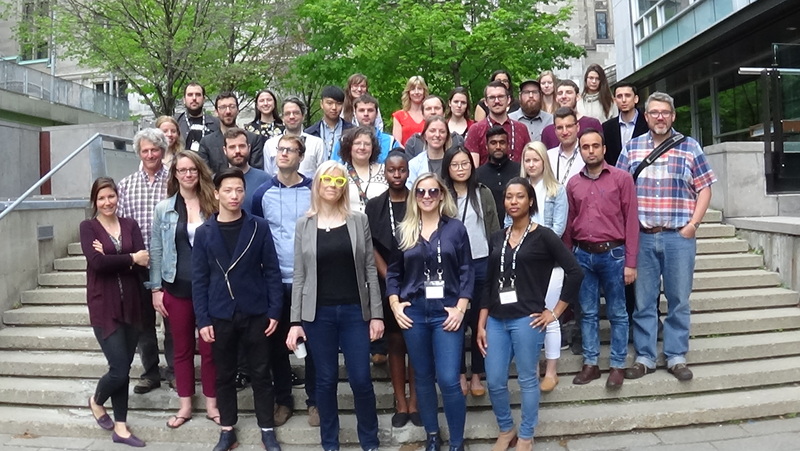 In this episode, we take a look back at Geothink’s 2017 Summer Institute at McGill University in Montreal, QC from May 25-27. The theme of this year’s Institute was “Smart City: Toward a Just City.” An interdisciplinary group of faculty and students tackled many of the policy, legal and ethical issues related to smart cities. Each of the three days of the Summer Institute combined workshops, panel discussions and hands-on learning modules that culminated in a competition judged by Montreal city officials and tech entrepreneurs. The goal of the competition was for student groups to develop and assess the major principles guiding Montreal’s 2015-2017 Montréal Smart and Digital City Action Plan. To start off the afternoon’s work, Rob Feick, an associate professor in Waterloo University’s School of Planning, discussed the idea of civic participation. Pamela Robinson, associate professor in Ryerson University’s School of Urban and Regional Planning, added to this call for action by presenting the work of her graduate students who created an evaluative framework for smart cities as part of Geothink. This theme of empowering the next generation of academics and practitioners to build more just and sustainable smart cities of the future was woven throughout the three days of sessions. It grew more tangible later in the first day when students heard from Montreal City Council Chairman Harout Chitilian. In an interview after his talk, he expressed a need for people to hire who possess unique skillsets and competencies important to designing services for smart cities such as his. In Montreal, plans include improving the cities smart offerings in a variety of areas that require trained workers. Chitilian set the stage for the three-day Institute but its faculty and participants kept each talk and activity lively and engaging. Thanks to Geothink’s five-year length as a grant, many relationships have been shaped by years of collaboration between co-applicants, collaborators, partners and students. As a result, the Summer Institute can be a good time to reflect. For one former Geothink graduate student who is now an assistant professor in the Department of Geography at University of Calgary, that means considering the progress Geothink has made educating her peers on topics such as smart cities, open data, crowdsourcing and volunteered geographic information. Those have been the topics of the four summer institutes hosted by the grant—each of which Victoria Fast has attended. This entry was posted in Conferences, Geothoughts Podcasts and tagged Geothink, geothoughts 14, institute, itunes, open data, podcast, SI2017, smart cities, students, summer institute 2017 on August 27, 2017 by Drew Bush.